The 2019 Mazda CX-5 was created to give you the power you crave in an SUV without compromising efficiency. This is thanks to the ultra-high tensile steel and powerful engine, which makes it lighter and stronger. The standard engine is a 2.5L SKYACTIV®-G 4-cylinder, which will give you 187 horsepower and 186 lb-ft of torque, along with an EPA-estimated 31 MPG on the highway. Mazda knows that some drivers will crave more power, which is why the higher trims come equipped with their most powerful engine - the 2.5L SKYACTIV®-G Turbo 4-cylinder. This engine gives you 250 horsepower and 310 lb-ft of torque, along with an EPA-estimated 27 MPG on the highway. You will gain the maximum amount of performance if you pair the available turbo engine with the available Predictive i-ACTIV All-Wheel Drive® system. While you drive, this intelligent all-wheel-drive system will keep an eye on many factors, including temperature and braking patterns to adjust for the best traction. The SKYACTIV-VEHICLE DYNAMICS with G-Vectoring Control Plus will also adjust when you’re driving around corners to give you the smoothest cornering possible. Test-drive it today at Werner Mazda. Mazda has a philosophy when it comes to designing their vehicles called “KODO,” which is the “Soul of Motion.” This can only be created by human hands, hand-shaping and guiding the design and capturing the energy within motion. Each detail on the 2019 Mazda CX-5 is deliberate and put in place to provide you with a vehicle that everyone will envy. You can choose between colors such as a vibrant Soul Red Crystal Metallic, a clean Snowflake White Pearl Mica and a mystic Deep Crystal Blue Mica. Find one that matches your soul and roll with it. Pair that with your choice of 17- to 19-inch wheels to create an affluent persona. See these exquisite details for yourself at Werner Mazda in Manchester, NH. Once you step into the 2019 Mazda CX-5, you will be transported to a premium and luxurious interior unlike any other. The Signature model adds an extra touch to this, including Nappa Leather seats, genuine wood trim, a uniquely stitched steering wheel and stunning ambient lighting. All these will set a mood that will make you never want to stop driving. Adding to this amazing comfort is the interior sound dampening. This will minimize the amount of sound coming from the outside of the vehicle while still allowing you to know what is going on around you. Sitting in the driver’s seat, you will notice the meticulous details and the intuitive placement of all the controls, which really optimizes your driving experience. 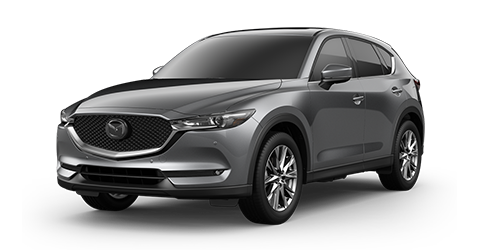 Werner Mazda is the best of all the Manchester, NH car dealerships to discover the ultimate comfort of the 2019 Mazda CX-5. You deserve an enhanced ride when you drive the 2019 Mazda CX-5, and this starts with the MAZDA CONNECT™ 6 advanced infotainment system. This system, which is displayed on the 7-inch color screen, will keep you connected with your vehicle and the world around you. You also have the option of equipping your Mazda CX-5 with the available Apple CarPlay™ and Android Auto™ connectivity. These programs allow you to access your apps, make phone calls, send texts with voice command, and listen to all your own music. Speaking of music, many drivers wonder what’s the best way to listen to your music while driving. Thankfully, Mazda equipped the 2019 Mazda CX-5 with an available Bose® 10-speaker audio sound system with Centerpoint® 2 and AudioPilot® 2. This sound system allows you to listen to your music the way it’s meant to be. Entertainment isn’t the only advanced technology within the Mazda CX-5. There is also the available Active Driving Display, which will project important information right onto the windshield, so you can keep your eyes on the road and focus on driving. This display can show information including your speed, safety systems, and alerts. Stay connected with the world in the 2019 Mazda CX-5. Test-drive yours at Werner Mazda today. Now is not the time to compromise on your safety. Test-drive the 2019 Mazda CX-5 at Werner Mazda in Manchester, NH. Werner Mazda is proud to offer their drivers the Mazda Extended Confidence Warranty. This warranty will cover you beyond the factory warranty on many of the most important aspects of your vehicle. For those drivers who want even more protection, Werner Mazda has a selection of additional services and plans to choose from that will cover what a traditional warranty will not. These plans may include tires and wheel coverage, gap coverage, the appearance of your vehicle and vehicle theft. Take advantage of the Extended Warranty and the Car Lease Options at Werner Mazda today.